Complete marbling/Ebru kit for paper, fabric and 3D marbling by Dodin's. 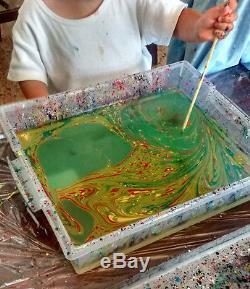 Including all the needed supplies, tools, samples and a quick start guide for easy and fun marbling, with no prior experience necessary. All the items included are premium and high quality, reusable and/or may be reordered. This is the kit for you! Or give it to a friend or family member as an incredible, original gift. 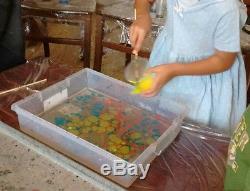 Brush 7 pieces of 3 sizes - special for marbling, ready to use. Carrageenan 225 g (8 oz, 1/2 lb) - enough for up to 8 marbling sessions (using dozens of sheets each time); dissolves in water without the need of using an electric blender. Comb 25.4/4.1 cm (10/1.6 in). Disposable plastic apron 5 pieces. Disposable plastic tablecloth 2 pieces. Fine paper 25x31cm (9.8x12.2 in), 30 sheets of 2 colors. Marbled paper sample 10 pieces. Needle tool/stylus - original, designed especially for marbling of Ebru flowers, etc. Paint 30 ml (1 oz), 7 plastic bottles, built-in eye dropper - red, yellow, and blue (primary colors), green, black, white, and metallic gold - ready to use, specifically developed for marbling without alum. Plastic tray 27x33x7 cm (10.6x13x2.8 in), with a lid - store the whole kit inside, before and after marbling. Quick start guide (English) - thorough, detailed, and easy to understand. 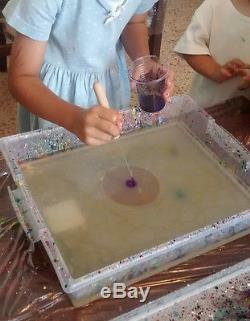 By professionals for beginners - developed and tested by Dodin's Marbling. Kid-friendly, by-design - compatible for ages 3+, including the tools (photos 2-5). 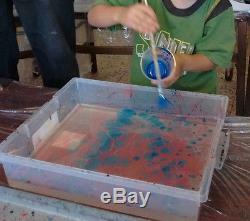 Also available - Starter marbling kit. The item "Dodin's Complete Marbling Kit 7C Plus Set Paper Fabric 3D Ebru Supplies Guide" is in sale since Monday, January 30, 2017. 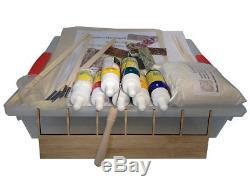 This item is in the category "Crafts\Art Supplies\Painting Supplies\Paint\Mixed Media Paint Sets". The seller is "newlinux" and is located in Beer Sheva. This item can be shipped worldwide.